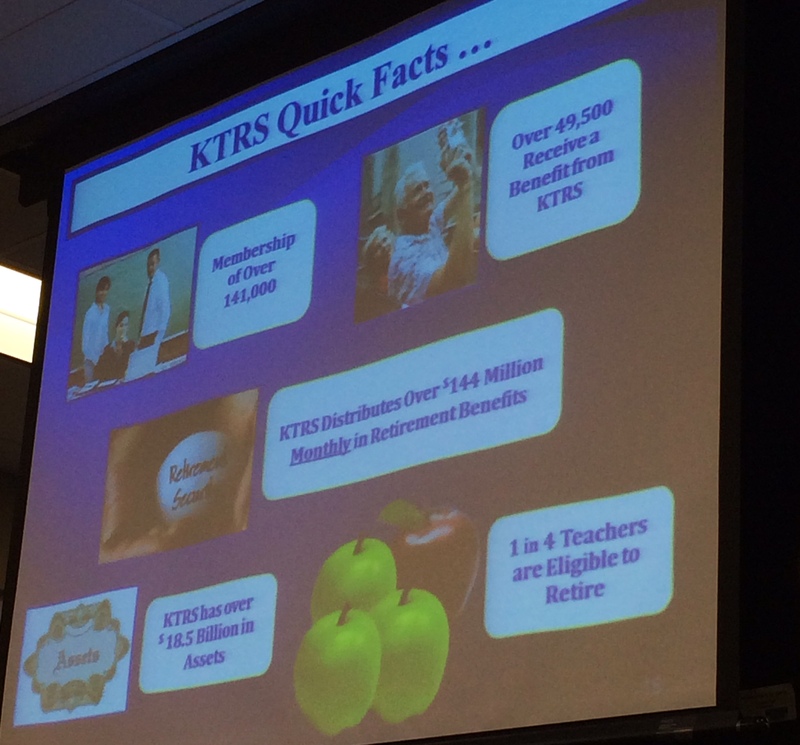 In the first briefing of the Kentucky Teachers’ Retirement System (KTRS) to the Public Pension Oversight Board (PPOB), KTRS Executive Director Gary Harbin said the system is at a “tipping point” and explained the need for new funds into their pension plan. After a proposal to bond $3.3 billion to shore up KTRS during the 2015 session fell flat, the group gave the PPOB an overview of their current status at the meeting Monday. The Public Pension Oversight Board was given jurisdiction over the retirement fund through legislation passed this year. Harbin said KTRS is currently funded at 53 percent and is in need of a large infusion of cash in order to keep up with their payroll as one in four of the teachers in the state are now eligible for retirement. A shocking statistic shared by Harbin was the size of their retirement fund, which he said is a section of the state’s budget four times the size of the woefully underfunded Kentucky Retirement System (KRS). Harbin said the current status of KTRS resembles that of KRS in 2008 and stated that if something is not done to help the system with their obligations, the state will face grave financial issues. Unlike KRS, funding from the legislature to KTRS has remained stable at 13 percent since at least 1998, according to charts in Harbin’s presentation. However, Harbin explained that since 1999, KTRS benefit payments have tripled and the system currently pays out $2.1 billion per year in benefits. The funding issues faced by the teachers’ system, instead, have come as a result of many issues including market changes, increased retirements as the “baby boomer” generation begins to draw from the system and retirees living longer. The average teacher retires at age 58 after 30 years of work and lives to be at least 80. Harbin also noted that as the funding level began to drop in the mid-2000s, the system had to begin selling off some of its assets, which gives them less flexibility for the investments that have aided in keeping the plan above water in recent years. Just this year, KTRS was ranked in the top ten percent in the nation for their investments and is seen as a national model for pension investments. Another reason for the underfunding, Harbin explained, is the move in the early-2000s, when the fund was at 97 percent funded, to divert some of the funds from the system into the employees’ health plan. Harbin said the movement of the dollars “never should have happened” because while it would not solve the system’s issues, it would still be an additional $336 million remaining in the plan. Because of the continuing struggles of the system to keep up, Harbin said without the bond proposal made last session, KTRS will be asking the legislature for $1 billion in the next budget cycle. Harbin stated that making sure the money is there for retiring Kentucky teachers because they are not eligible for social security benefits, making this their only source of income. When asked, Harbin said it would cost around $690 million per year to put teachers in the social security system. As for what can be done about the funding issues moving forward, Harbin stated that he is pleased with the formation of a KTRS working group by Gov. Steve Beshear, which Kentucky Chamber President Dave Adkisson will serve, to study the system and suggest changes to strengthen the retirement plan. Harbin also said the idea of bonding is still on the table, in the system’s view, but that they are open to other ideas as well. During the debates over bonding last session, proponents argued that the interest rates for bonds were “historically low” and that action needed to be taken immediately while many expressed concerns about the influx of cash without structural changes to the system. In the meeting Monday, Harbin explained that it is estimated interest rates could remain low for the next 18 months before they could go up by at least one percent. After being appointed to the KTRS work group, Kentucky Chamber President Adkisson stated he hopes outside experts are brought in to help find a solution to ensure financial stability of the system. “The Kentucky Chamber believes the pension issue is the most pressing challenge to the financial stability of the Commonwealth of Kentucky and takes these challenges very seriously. My hope is that this group engages independent experts and takes real steps to address the persistent problems within the retirement system,” Adkisson said.